.....is an account of the life of "colored" Annapolitans during the period 1900-1950. Mr. Brown writes from the vantage point of one who lived through the injustices of segregation, and the decades of integration. He touches on the present, yet his conclusions are brief and poignant. Born in Annapolis, MD in 1909, Mr. Brown received his Elementary Teachers Certificate from Bowie Normal school in 1928. This began a distinguished career in the Anne Arundel County school system which spanned 42 years. He has been recognized for his contributions to the community by awards and commendations from all levels of government, including President of the United States, national magazines, and most importantly from the community he has worked so diligently to serve. He has also authored the highly acclaimed "A Century of "Separate but Equal" Education in Anne Arundel County"
It is with a familiar tone that Phillip Brown describes 20th century black life in Maryland's capital city. Drawing on oral histories, archival records, and photographic collections the author depicts scenes in many cases imbued by his own memories to fill what were formerly blank pages in local history." The Book itself is a hardback with a dust cover consisting of 147 pages with over 200 photos. It is an excellent coffee- table book to share with family and friends and can be purchased on-line for only $29.95. 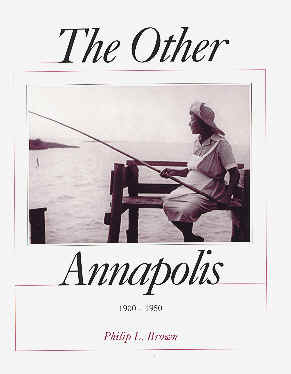 Click here to order your copy of "THE OTHER ANNAPOLIS"